All Famous Indo-Pak Express Aisam Ul Haq and Rohan Bopanna will not team up from the next season. Both of them ended with career highest No.5 Doubles team ranking in 2011 season. 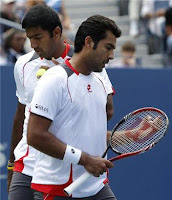 Bopanna has expressed his desire to team up with Mahesh Bhupati, in order to prepare for the upcoming London Olympics 2012. This decision came after their crushing defeat against Fyrstenberg/Matkowski in the ATP World Tour Round Robin fixture. They together in 2011 ended up with 38-29 winning record and three ATP doubles championship titles under their belt including ATP 1000 Paris Masters. Aisam will team up with World No. 20 Jean-Julien Rojer, for the next year and the duo will take off its campaign from the Australian Open in January. “Rojer is in the top 20 so I am confident that we can make a good team. I completely respect Bopanna’s decision to change partners. I will concentrate on maintaining my rankings to qualify for the Olympics so that I can also take another Pakistani with me to the grand event,” told Qureshi on his return to Pakistan.